Mardi Gras is now in full swing and what better way to celebrate Mardi Gras than with my Spicy Buffalo Shrimp Po’ Boy Sandwich, a quintessential New Orleans dish and a Po’ Boy of your dreams. 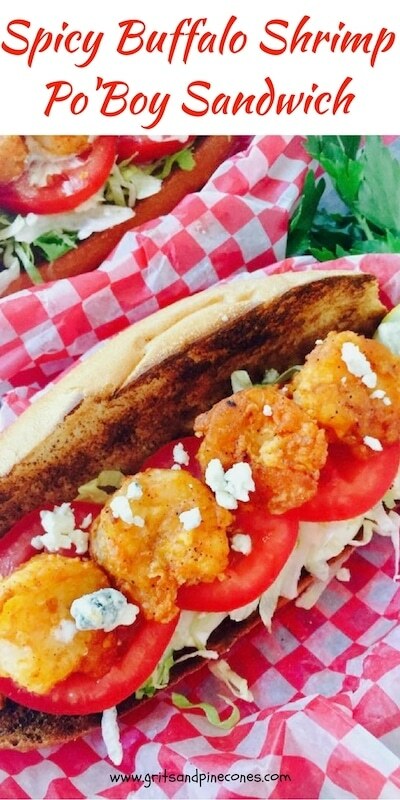 These Spicy Buffalo Shrimp Po’Boy sandwiches are overflowing with juicy, briny, sautéed buffalo shrimp, plus lettuce and tomatoes, which are piled high on a toasted Po’ Boy roll. Mardi Gras is a whole season – not just one day. Fat or Shrove Tuesday is the biggest day of celebration, and the date it falls on moves with each calendar year. Fat Tuesday can be any Tuesday between February 3 and March 9. Mardi Gras, with its parades and parties, begins on January 6, the Twelfth Night (Feast of Epiphany), and continues through midnight on Fat or Shrove Tuesday, the day before Ash Wednesday. This year, Mardi Gras ends on Tuesday, February 13. I made these Spicy Buffalo Shrimp Sandwiches without the traditional remoulade sauce. But my sister Chula over at the Pudge Factor blog has a fabulous recipe, which she graciously shared with me in case you would like to use it on your sandwiches. New Orleans remoulade is a spicy mustard-based sauce. According to Chula, “you can easily adjust how spicy the remoulade sauce is by adding more or less horseradish and leaving out the cayenne pepper.” Of course, you can also purchase prepared remoulade too, if you want to save some time or substitute tartar sauce or mayonnaise. But if you are looking for an authentic remoulade recipe, you should try hers. Need more ideas? Check out Ten Classic Mardi Gras Recipes. 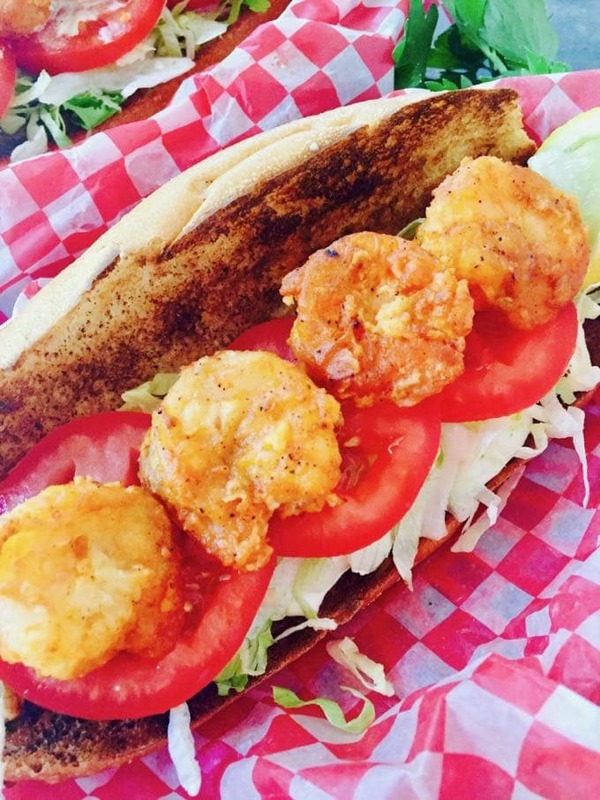 How to make Spicy Shrimp Po’ Boy Sandwiches! Add flour, salt and pepper and garlic powder to a gallon size Ziploc bag. Add shrimp and shake well. Shake off the excess flour and add the shrimp to the pan in a single layer. Cook the shrimp for 1-2 minutes on one side, or until golden brown. Then turn over and cook on the other side for another 1-2 minutes. 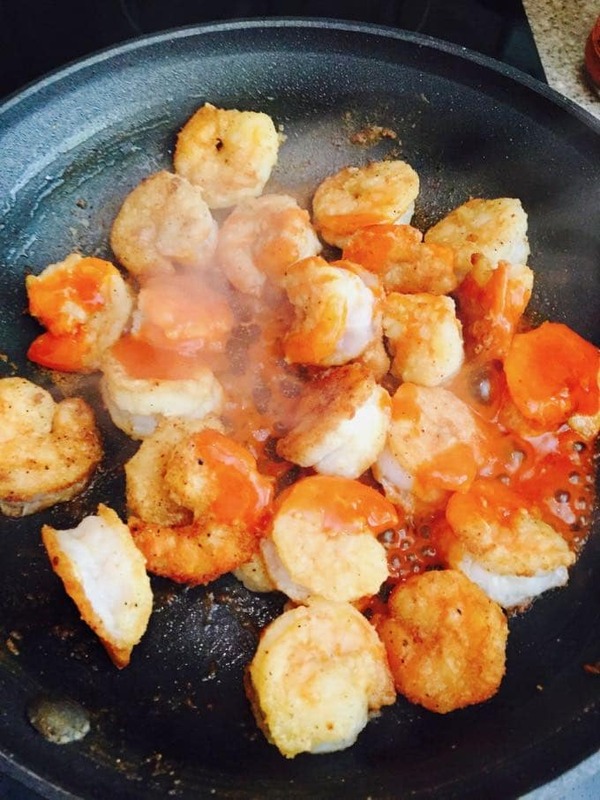 When the shrimp are cooked, leave them in the pan but remove the pan from the heat and add the buffalo sauce. Stir until the shrimp are well coated. Set aside. 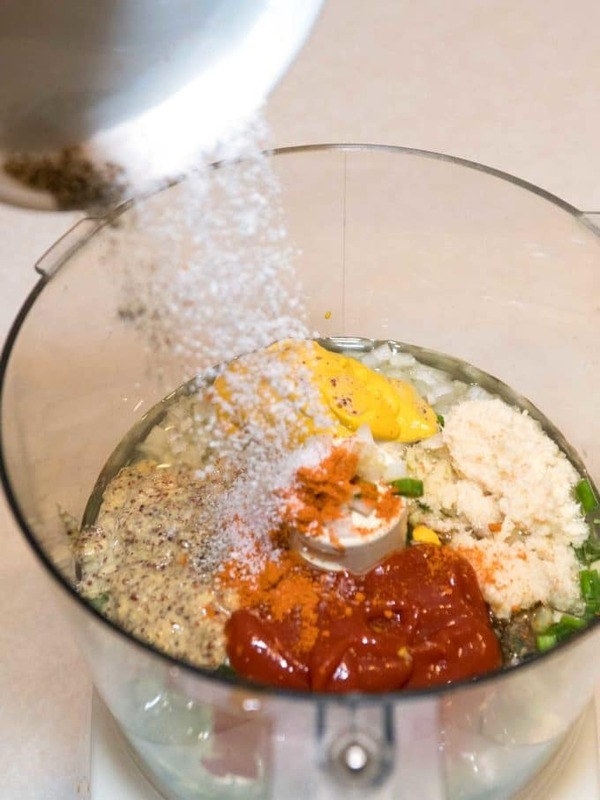 To make the remoulade, combine all ingredients in the bowl of a food processor fitted with a steel blade. Process 30 seconds or until well combined and vegetables are nicely minced. Store covered in a non-reactive bowl in the refrigerator. Yield: 3 cups. To make the sandwiches, split the rolls in half lengthwise, and place on a baking sheet under a preheated broiler for 2-3 minutes or until the surface of the rolls is lightly toasted. If you are using remoulade, spread a generous layer on one side of the roll. (You can substitute tartar sauce or simply mayonnaise). Add shredded lettuce and sliced tomato. Top with shrimp, and optional blue cheese crumbles, and serve immediately. Let the good times roll, or laizzez les bons temps rouler! 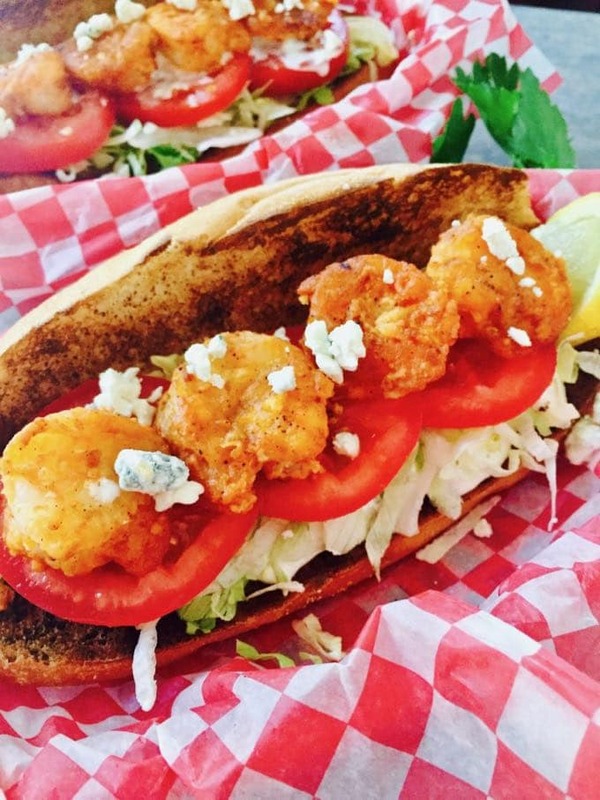 Spicy Buffalo Shrimp Po’ Boy sandwiches are overflowing with juicy, briny, sautéed shrimp, plus lettuce and tomatoes, all piled on a toasted Po’ Boy roll. 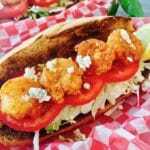 4 Po' Boy rolls can substitute French bread or another type of roll with a crispy crust and fluffy interior. Add the flour, salt and pepper and garlic powder to a gallon size Ziploc bag. When the shrimp are cooked, leave them in the pan but remove the pan from the heat. Add the buffalo sauce and toss to coat the shrimp. Set aside. Combine all ingredients in the bowl of a food processor fitted with a steel blade. Process 30 seconds or until well combined and vegetables are nicely minced. Store covered in a non-reactive bowl in the refrigerator. Yield: 3 cups. Split the rolls in half lengthwise, and place on a baking sheet under a preheated broiler for 2-3 minutes or until the surface of the rolls is lightly toasted. If you are using remoulade, spread a generous layer on one side of the roll. (You can substitute tartar sauce or simply mayonnaise). Add shredded lettuce and sliced tomato. Top with shrimp and serve immediately. WOW, this looks and sounds amazing!!! !